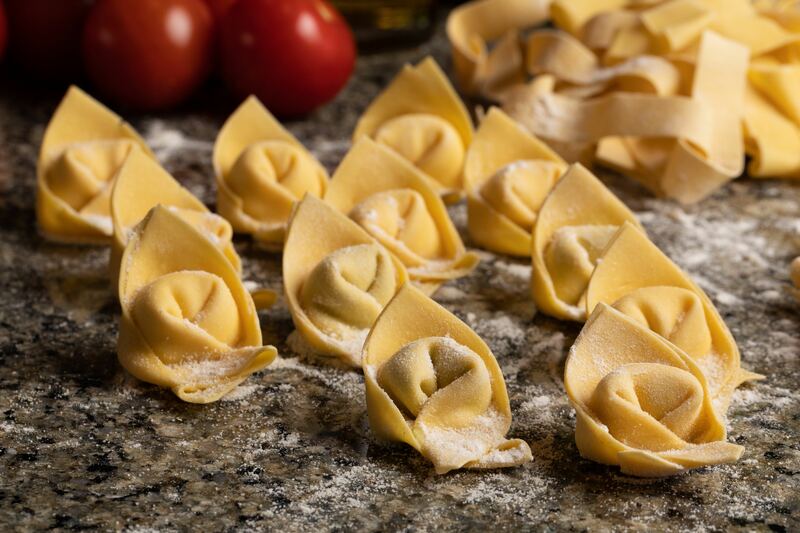 Why you should try to make it to the upscale trattoria during Houston Restaurant Weeks. It’s a Thursday night and Amalfi Ristorante Italiano and Bar is packed to the gills (pun intended given the restaurant’s fresh seafood focus—but more on that later). 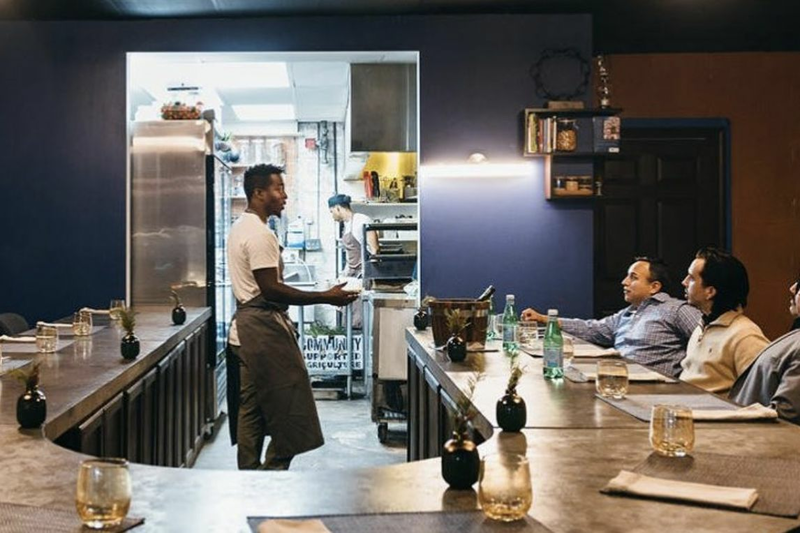 Servers and bussers are gracefully interweaving through the main dining space, delivering course after course to tables of customers who seem more than content to kick back and stay awhile. Although such traffic could be attributed to Amalfi’s participation in Houston Restaurant Weeks, I know better. 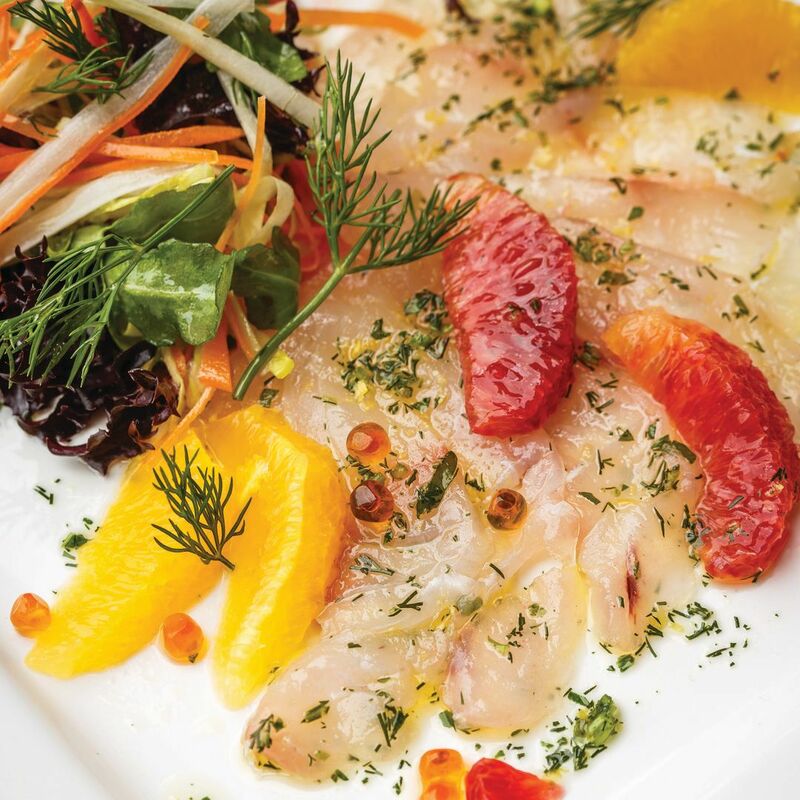 I visited Amalfi shortly after its opening and not only witnessed similar spirited business, but also came quickly to understand why the restaurant easily wins over the hearts of first-time patrons and prompts them to become regulars. In short, the food is impeccable. 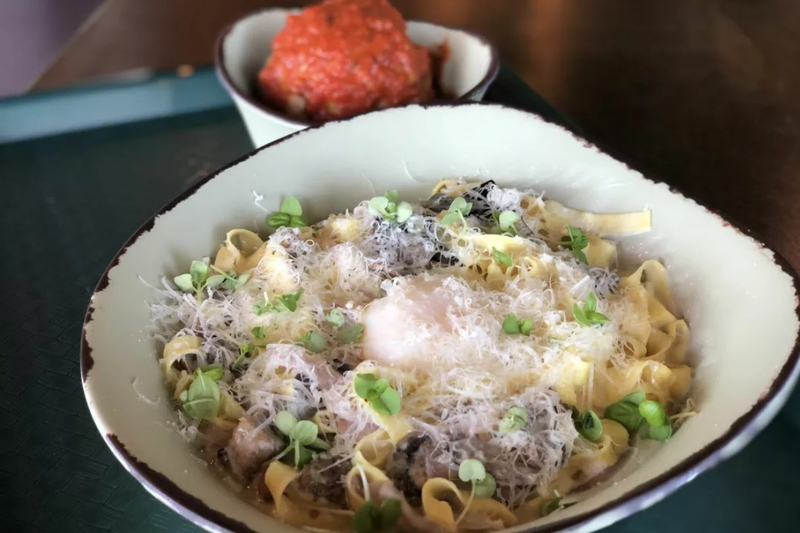 Chef-owner Giancarlo Ferrera creates menus that are like albums in which every song is a chart-topper; search for the weak link and you will come up empty-handed. I was thankful for the offer of a frozen Bellini before any food was served, as the icy citrus beverage easily made me forget the fact I had just come from sweltering inferno that is summer in Houston. 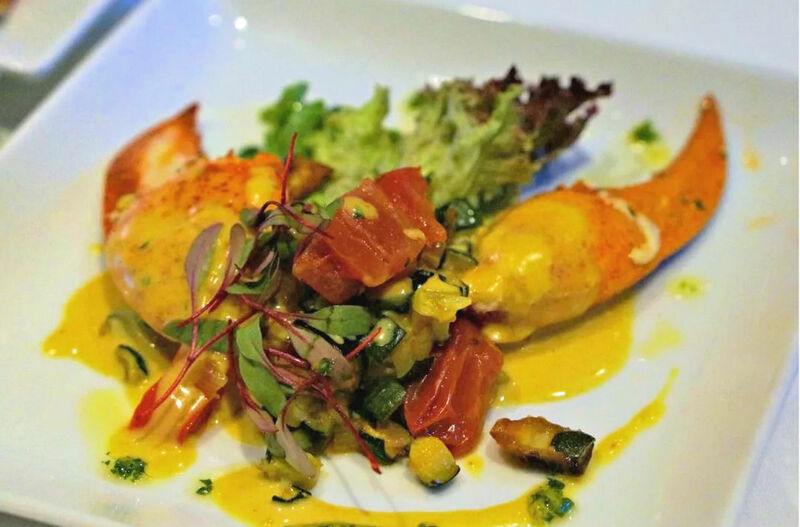 The drink’s mild stone fruit notes turned out to well complement the beautiful appetizers that quickly followed, such as the aragosta e arance, sweet juicy lobster medallions resting on a bed of arugula, with orange pieces and pink peppercorn dressing. This dish was particularly compelling for its balance of botanical and piscine flavors. 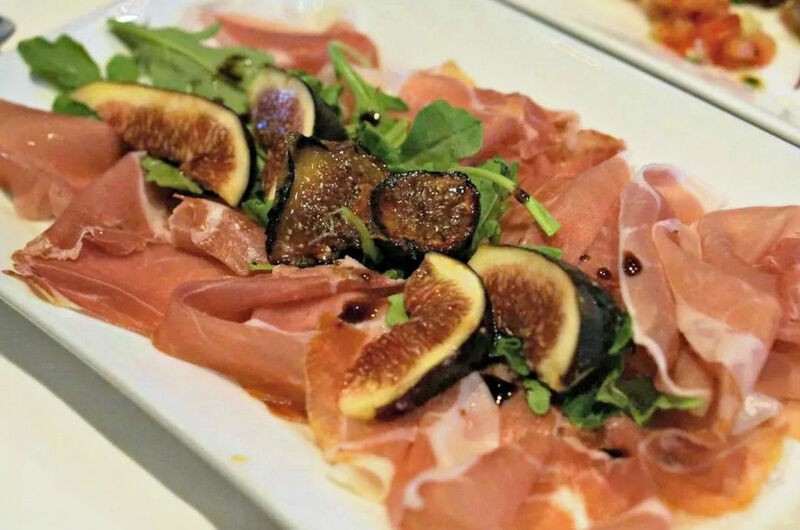 A similar beautiful portrait of fruit and vegetable elements could be found in the fichi con prosciutto di parma e balsamico, a Restaurant Weeks special of dark, sweet black mission figs served with fatty prosciutto sliced paper thin and drizzled with a tangy balsamic vinaigrette. Rounding out this impressive triptych of appetizers was a tartare of blue fin marinated with sea salt, orange zest and olive oil, framed by fragrant diced tomatoes mixed with basil, pepperoncini and shallots atop microgreens, and laced with balsoy (balsamic soy sauce). 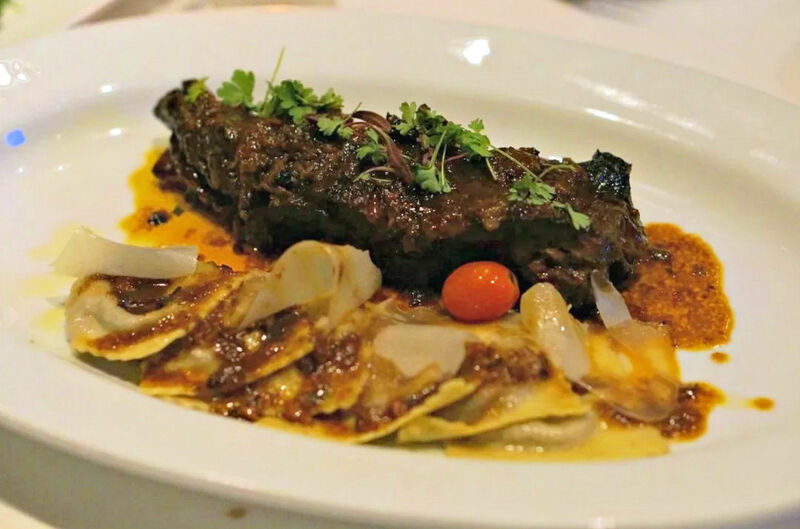 These lighter, sophisticated dishes were a great warm-up for heavier, richer meats and starches to follow in Amalfi’s HRW entree offerings. I hope my dinner companions didn’t notice me pouting after I first tasted the ravioli di radicchio con costine di manzo, for simultaneous to my appreciation of the dish’s remarkably unctuous short ribs paired with ricotta-and-herb-stuffed handmade ravioli, was, of course, the realization that I had to share this dish. Fortunately, there was plenty else to distract me and satisfy my gustatory greed, such as a slightly intimating 16-ounce pork chop (costoletta di maiale al forno ai funghi di bosco) rendered smoky, supple and earthy via a long oven roast and a black-garlic-and-mushroom sauce. As much as I enjoyed both of the aforementioned, the entree that stole my heart was the paccheri al sugo d’anatra, al dente oversized tubular pasta cloaked in black truffle cream and topped with duck confit. I wanted that dish all to myself plus seconds. 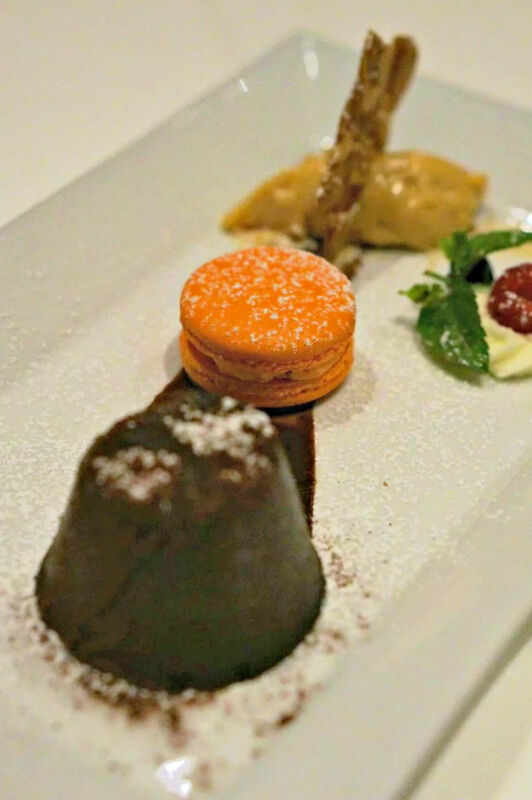 Dessert is not an afterthought at Amalfi. After such a dinner, dessert was an afterthought for me. 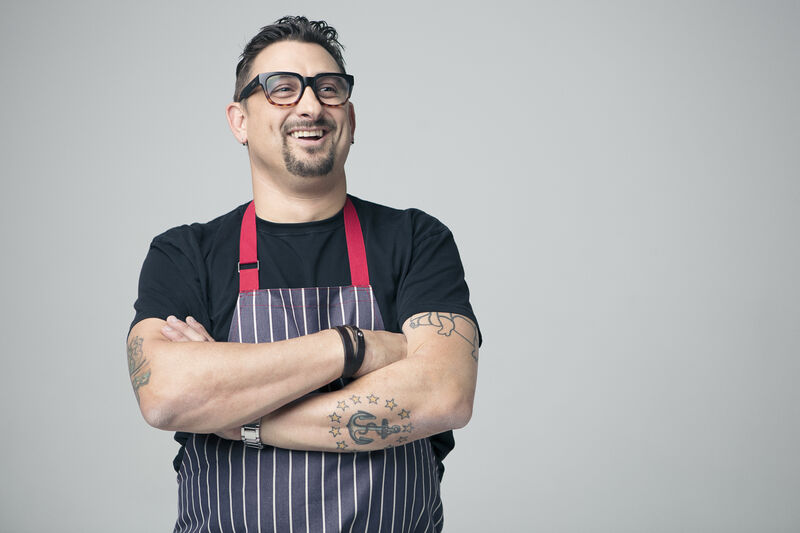 Not so for Ferrara and his crew, who, if you allow me to indulge in a timely Olympics metaphor, are eager to stick the landing and therefore create dolce with the same painstaking detail as they do their savory fare. From their regular menu, the torta caprese con gelato al pistachio is making a guest appearance on the HRW, a testament to this chocolate and almond cake’s enduring popularity. Perhaps even better than the cake is the accompaniment of a scoop of pistachio ice cream, whose bold nut flavors was literally and figuratively refreshing in light of the dull other versions of this ice cream I’ve tried. Don’t despair if you can’t make it to Amalfi during HRW (though you should damn well try) because some of the specials (e.g., fichi con prosciutto di parma e balsamico) will be available as long as the featured produced is in season.